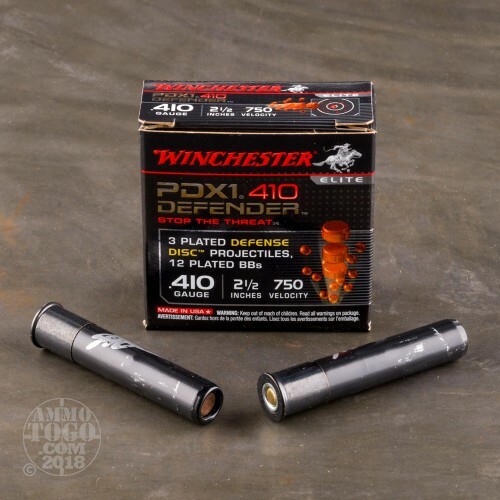 This 410 Bore shotshell from Winchester’s PDX1 Defender line of ammunition is, appropriately, specialized for self-defense and an ideal ammunition if you favor a revolver such as the S&W Governor or the Taurus Judge. When you fire the shell, three plated defense disc projectiles first exit the muzzle to penetrate and likely knock down your assailant. 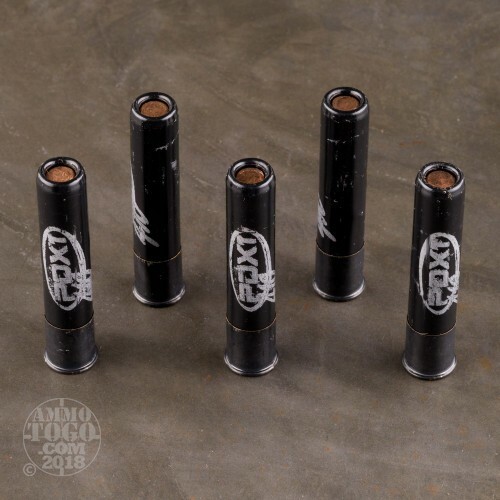 Following after the discs will come 12 plated BB shot pellets, hard .18” diameter spheres which deliver tremendous shock over a wide area that will effectively compensate for a poorly aimed shot. The effect is a blast that will thoroughly devastate its recipient, and hard to improve upon for short range personal protection. Alternatively, this shell will deliver quite well should you engage it for pest control and varmint hunting -- what will devastate a human-sized threat won’t do many favors to a raccoon. This shell’s black hull is distinctive enough that you won’t mistake it for another round, and its primer is plenty reliable to serve you well however you’d like to implement it. This is the best shot ammo for the Taurus Judge by far. I have shot this ammo from my public defender and had zero problems. At 30 feet I was able to hold a 3.5 group with the discs and a 7 to 8 inch with the bb' s behind the discs. there is a 3rd part of the equation with the weapon at #1 the ammo at #2 and most importantly 3rd the shooter. I have shot many of these out of my Taurus Judge Magnum and am happy to say I havent had any trouble with this ammo. It groups well. About what to expect from its two inch barrel. As for all the others who complain about .410 shells being hard to eject. I haven't had that problem either. For HD. I keep the Judge loaded with three of these and two Hornady Critical Defense. 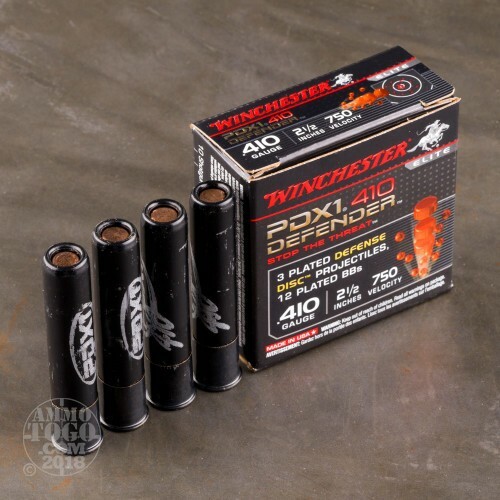 Great product that addresses buckshot's quick to pattern off-target tendency out of a rifled Judge barrel past 15'. 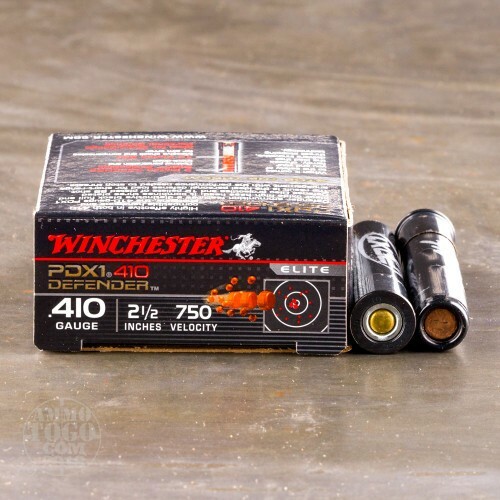 Having shot many OOO buckshot rounds out of a Judge 2.5" chamber, 3" barrel it is easy to see the wide, erratic patterning with some brands of buckshot, and wide & thin dispersement of #4,#6,#8 shot past absolute point-blank range. The 3 wad-cutter type discs group in a fist-sized pattern up to 25', which is by the way, about the distance from someone's TV couch to their front door or bed to their bedroom door if attacked. Think about it; 20 - 25' is shorter than you think. 15 feet you get torso-sized group of 12 BBs also. Consistent, and definitely a full-power load. It earns 5 stars.